You are here: Home / Featured / Question of the Week: What Are the Best Dark Reign Comics? Question of the Week: What Are the Best Dark Reign Comics? I’ve been getting this one a lot lately, and I can understand why. Unlike the Marvel events from 2004 to 2008, Dark Reign was functionally a state of the union. Instead of varying degrees of essential tie-ins, you have a status quo reaching its sinister, and slightly green fingers into the heart of the Marvel Universe. There’s a lot of good stuff to come out of Dark Reign, I think in many ways because it’s a wonderfully simple concept that can take on new heights in the right hands. What if the bad guys won? Dark Reign carries out that line of “What If?” for a whole year, and although we’ve certainly seen variants on the theme in superhero comics (Grant Morrison and Frank Quitely’s JLA: Earth-2 , Emperor Doom , Mark Waid’s Empire ), it’s never been as sprawling as Dark Reign. 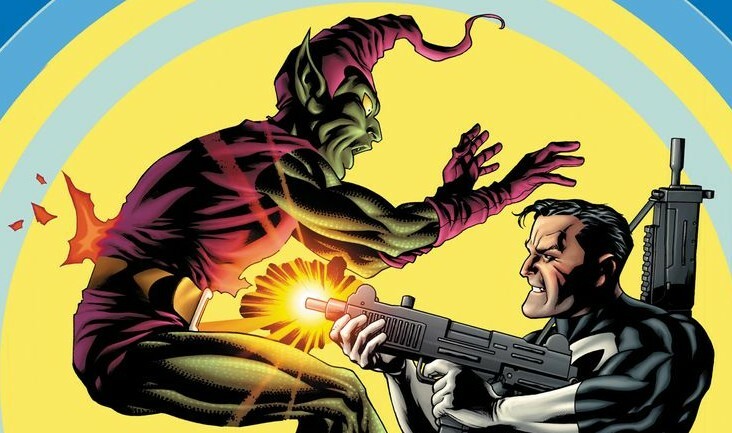 So without further ado – what’s the cream of the crop from Dark Reign? I’ve narrowed it down to my 10 favorites. The Top 10 Dark Reign Comic Book Stories! There’s a scene in New Avengers where Clint Barton (in his Ronin costume) decides the only way out of Dark Reign is to take out the man at the top. It’s a strong, brash moment, but coming from Hawkeye we know it’s ultimately just talk. Then there’s The Punisher #1 opening with Frank Castle’s sniper set on the Marvel U’s new top cop. Ain’t no doubt he aims to kill. The action fires into overdrive from there as Frank fights The Sentry (!!! ), the son of Wolverine, and The Hood. This is one of Rick Remender’s first Marvel works, and would lead to big weird things for The Punisher! While there’s no core “event” book for Dark Reign, Dark Avengers comes closest. This is where you’ll get an inside look at the new Top Cop and his team of hand-picked criminal Avengers (hint: the Thunderbolts program needs some new recruits). Another Dark Reign launch that can’t be discounted, these five issues of Fantastic Four mark the beginning of Jonathan Hickman’s creative run on Marvel’s first family. It’s amazing how much of the stage is set for the Fantastic Four to come in this series, with Reed Richards exploring the multiverse like he never has before. Simply put, this is the best Dark Reign tie-in, and one of my favorite Marvel comics series. It’s the comic book that gave me hope for Agents of SHIELD, made me love Nick Fury, and inspired me to walk around parks hollering “One Man!” and quietly weep to myself. Notably, this is Jonathan Hickman’s first solo series with Marvel, after co-writing the Secret Invasion: Secret Warriors debut with Brian Michael Bendis. Highly recommend you continue reading past issue #10 through to completion (28 issues in total). Zeb Wells and Clay Mann took one of the most prominent faces from Secret Invasion and brought her back to Earth in fittingly violent fashion. The Elektra miniseries definitely packs more payoff if you’ve been invested in everything from Frank Miller’s Daredevil to Wolverine: Enemy of the State to New Avengers: Illuminati . With all of that in your pocket, though, this series is a slight homage to Elektra: Assassin (Elektra captured and hunted by Norman Osborn’s Dark Reign), and also addresses the complicated nature of Elektra Natchios. When was she abducted by Skrulls and what in her past can she be held responsible for? Another book that deals primarily with Secret Invasion fallout, Spider-Woman hands the Marvel U’s mantle of “most screwed over person” to Jessica Drew. Jess returns from her Skrull vacation to find out that the Queen of the Skrulls was using her face and persona during the Earth invasion. As Kanye would say, that’s a pretty bad way to start the conversation. From there, Spider-Woman is given the opportunity to work as an Agent of S.W.O.R.D., hunting down skrulls for vengeance and profit. Naturally, it isn’t long before Madame Hydra approaches Jess with an offer of her own. Admittedly, I’m a sucker for any Brian Michael Bendis and Alex Maleev creative team-up , and this one is no exception. Strangely, this series was also one of Marvel’s short-lived motion comics series. This is the series that convinced me there was a place for Moon Knight in the Marvel Universe. The premise is fairly continuity-laden, but essentially all you need to know is Moon Knight appeared to be dead/exiled, and now he’s back in New York during Osborn’s Dark Reign. Gregg Hurwitz asks whether we can ever truly overcome our pasts, while Jerome Opena showcases the mind-blowing artistic skillset he would take to Uncanny X-Force in a few short years. Easily the most joyous and carefree book on the list, Kieron Gillen and Steve Sanders’ first inside look at the SHIELD of space is funny, fast-paced, and delightful. It’s a shame we only got five issues here, as the potential for Director Abigail Brand, Beast, and crew dealing with the entirety of space threats is hugely appealing. As it stands, we find Brand (who readers may remember from Astonishing X-Men) trying to hang on to leadership of SWORD in the aftermath of Secret Invasion. Turns out Earth getting invaded by aliens during your watch isn’t a great look. Fortunately, this book only gets better as it goes. Yes, it’s a one-shot, and yes, its inclusion might be entirely based on a single Doctor Doom short story. But I included The Cabal on my best Marvel stories from 1998 to 2015 list, so no way I can flip flop now. If you ever wonder what the rest of the globe looks like during America’s Dark Reign, you can’t do much better than Dracula attempting to takeover London. Highly recommend you read this full fifteen issue series, which begins with a four issue crossover with Secret Invasion. Do you have a Punisher reading order? Because try as i might, i cannot find one. There’s more, of course, but hopefully that tides you over a bit. Enjoy the comics! Reading Dark Reign now! (using your reading order) FF was really good, actually going to follow FF after this bc I liked it so much. Elektra and Secret Warriors were also really good – currently reading Punisher’s arc which is badass! Nice, I love that run on Punisher. Enjoy!